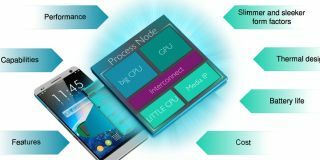 ARM has revealed more details on its next generation of its high-performance CPU in the shape of the Cortex-A72 designed for mobile devices. The company used its annual Tech Day event to shed more light the replacement for the Cortex-A57 that will bring faster and more efficient performance into a CPU that is much smaller than its older brother, according to Ars Technica. Less is more when it comes to ARM's new range and it claims that the smaller area and reduced power consumption results in a clock speed of 2.7GHz that is around 10% higher than the A57's 2.5GHz. That's not all as it also offers an 18-30% better performance per watt score than the A57. "Our focus on A72 was to achieve next-gen performance and pull a ton of power out of the design. We did that in spades," said Mike Filippo, ARM's chief architect for Cortex-A72. Firmly targeted at the 14nm and 16nm next gen process nodes, ARM has also engineered branch prediction that outperforms the A57 by 20%, a completely reworked 3-way L1 cache and a much smaller, reorganised dispatch unit. What we really want to know is how is stands up against Intel's Broadwell CPU and, according to ARM, it isn't good when there's power by the bucket load and in that instance it was firmly trounced by Intel's chip. Although when the power and thermal envelope are dulled down the Cortex-A72 almost catches up with the Core M. That's according to ARM's figures at least. We first heard about the Cortex-A72 back in February and ARM predicts that the first 16nm FinFET mobile SoCs with the CPU on board will ship at some point in 2016. Check it out: Who wants to squeeze ARM out of server market?